A 29-year-old male presented with sudden painless diminution of vision for 4 days in the left eye. Vision was 6/6 in the right eye and 6/36 in the left eye. The anterior segment was within normal limits. Posterior segment biomicroscopy with 90D revealed premacular hemorrhage in the left eye confirmed on fundus photography [Figure 1]. 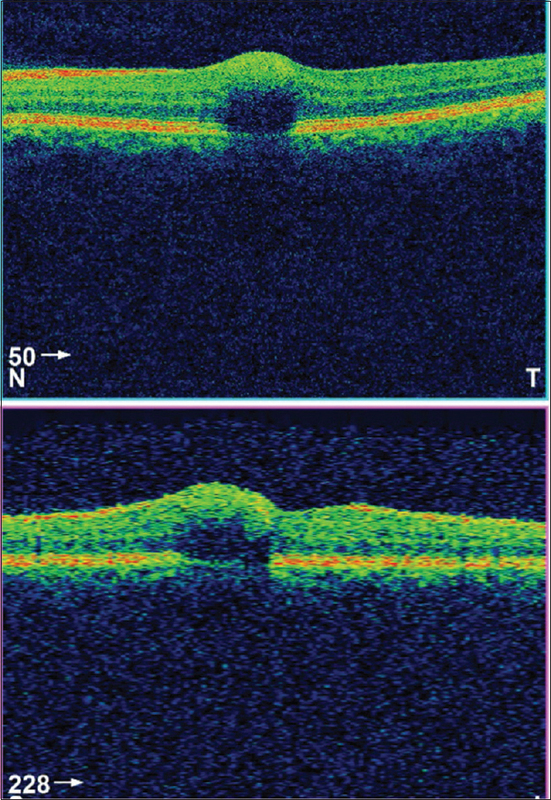 Optical coherence tomography showed a highly reflective, sharply demarcated, and dome-shaped hemorrhage in the superficial retinal layer [Figure 2]. There was no history of trauma, heavy exertion, and valsalva maneuvering. Complete hemogram, coagulation profile, and peripheral blood smear are within normal limits. On inquiring about any visit to hill station, the patient gave the positive history of travel to Leh 10 days back by air leading to rapid ascent. At 6-week follow-up, there was complete resolution of premacular hemorrhage with the attainment of 6/6 vision. High-altitude illness is a rare cause of premacular hemorrhage. It occurs due to rapid ascent to high altitude >2500 m. Leh is at an altitude of 3524 m. It may be associated with retinal vascular dilatation, superficial hemorrhages, papilledema, vitreous hemorrhage, exudates, neovascularization, glial bands, and retinal detachment. 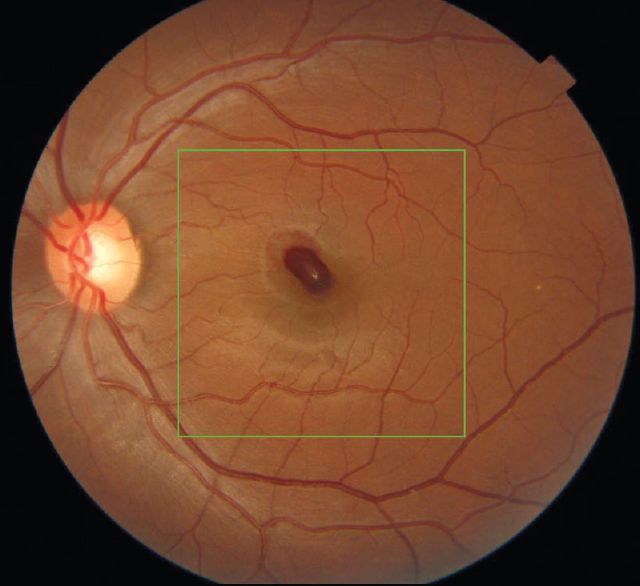 High-altitude retinopathy was graded by Weidman according to number and area of distribution of retinal hemorrhage. He has only premacular hemorrhage with no other findings. There are several other causes of premacular hemorrhages which include proliferative diabetic retinopathy, anemic retinopathy, blunt trauma, retinal vein occlusion, Valsalva retinopathy, retinal macroaneurysm rupture, Terson syndrome, Shaken baby syndrome, and age-related macular degeneration. Hanifudin A, Lim LT, Ah-Kee EY, El-Khashab T. High altitude subhyaloid hemorrhage. Oman J Ophthalmol 2015;8:213-4. Paralikar SJ, Paralikar JH. High-altitude medicine. Indian J Occup Environ Med 2010;14:6-12. Goswami BL. High altitude retinal haemorrhage. Indian J Ophthalmol 1984;32:321-4. Wiedman M. High altitude retinal hemorrhage. Arch Ophthalmol 1975;93:401-3. Mennel S. Subhyaloidal and macular haemorrhage: Localisation and treatment strategies. Br J Ophthalmol 2007;91:850-2.